India's central bank surprised most economists by keeping its policy rate steady after two rate hikes earlier this year but shifted its policy stance to "calibrated tightening" from neutral while lowering its forecast for inflation. The Reserve Bank of India (RBI), which had raised its repo rate by 50 basis points to 6.50 percent following hikes in June and August, underscored the uncertainties surrounding the outlook for economic growth and inflation, pointing to escalating trade tensions, volatile and rising oil prices and tighter global financial conditions. Illustrating this uncertainty, the bank's monetary policy committee was again split in its decision - as in August - with 5 members, including the governor, voting to maintain the rate and Chetan Ghate voting for a 25-point rate hike. The MPC was also split in deciding the policy stance, with 5 members voting for changing to calibrated tightening while Ravindra Dholakia voted to keep the stance neutral. "The inflation outlook calls for a close vigil over the next few months, especially because the output gap has virtually closed and several upside risks persist," RBI said, adding the shift to a calibrated tightening stance was in line with its objective of reaching inflation of 4.0 percent, within a band of plus/minus 2 percentage points, while supporting growth. The forecast for consumer price inflation, including the impact of housing rent allowances for central government employees, was lowered to a range of 3.9 to 4.5 percent for the second half of the current 2018-19 financial year, which began April 1, from 4.8 percent forecast in August. 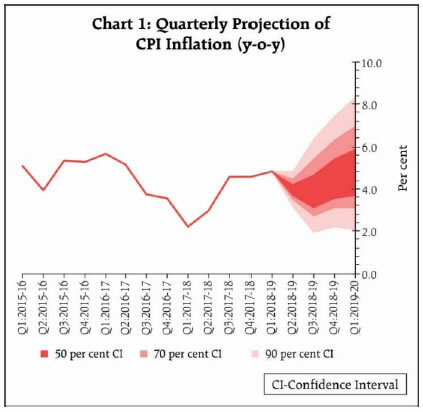 For the first quarter of 2019-20, RBI forecast inflation of 4.8 percent, with risks somewhat to the upside, from an earlier 5.0 percent. Despite the fall in the rupee's exchange rate, India's inflation rate has been falling in the last two months and fell to 3.69 percent in August from 4.17 percent in July due to lower food prices. "Actual inflation outcomes, especially in August, were below projections as the expected seasonal increase in food prices did not materialize and inflation excluding food and fuel moderated," RBI said. The RBI said global economic activity had remained resilient in recent months despite trade tensions but was now becoming uneven and global trade was weakening as reflected in export orders and automobile production and sales. India's economy has been expanding strongly and gross domestic product growth hit a 9-quarter high in the second quarter of 2018, or the first quarter of financial 2018-19, of a higher-than-expected 8.2 percent, boosted by the government's focus on roads and affordable housing. 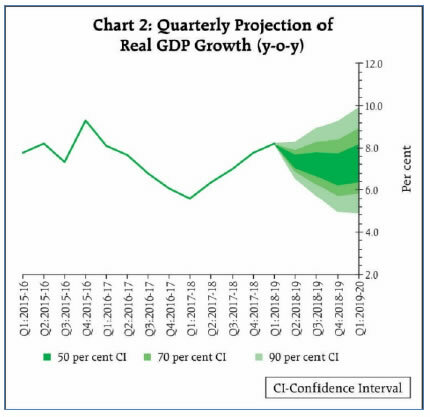 Looking ahead the RBI maintained its growth forecast for 2018-19 at 7.4 percent but trimmed its forecast for growth in the first quarter of 2019-20 to 7.4 percent from the August forecast of 7.5 percent, mainly due to the strong base effect. India's rupee, which has been deprecating this year, as most other emerging market currencies, weakened to new record lows in response to the RBI's decision to 74.17 per U.S. dollar. Shortly after it bounced back and was trading at 73.87 to the U.S. dollar, down 13.6 percent since the start of this year. 25. The next meeting of the MPC is scheduled from December 3 to 5, 2018."